Posted April 19, 2018 by laurielmorrison & filed under Every Shiny Thing. Hooray! 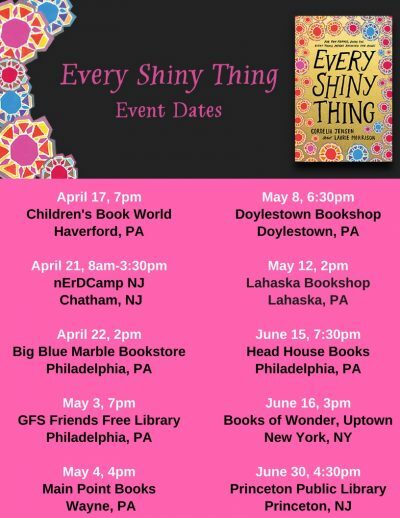 Every Shiny Thing, the middle grade novel I co-wrote with Cordelia Jensen, came out yesterday. 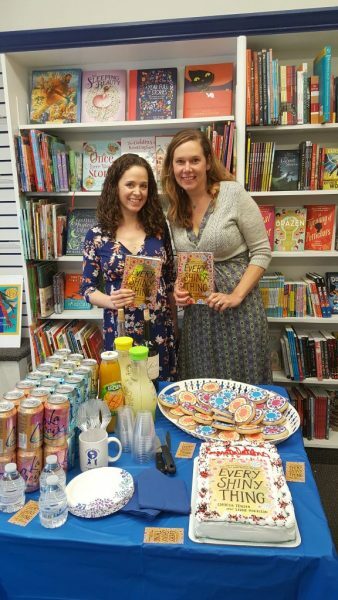 We had a wonderful time celebrating with friends and family at our launch party at Children’s Book World in Haverford. We’ve also been busy writing more guest blog posts and answering great questions for a variety of fun interviews. Here’s a round-up! Our Vermont College of Fine Arts MFA classmate, Linda Washington, interviewed us about our collaborative process at Through the Toolbooth. On Middle Grade Mafia, we answered Debbie D’Aurelio’s great questions about our writing process and what we hope kids will get out of the book. I got to participate in the New Kids on the Block debut series on Pop! Goes the Reader with a post about all the things I learned from Every Shiny Thing…in list poem form, in honor of National Poetry Month. We had a blast coming up with ten intriguing facts about the book for YAYOMG, so if you want to know about the details we stole from our real lives to use in the book, check out that post for sure! We’re also gearing up for more book events. Here are the dates and times for our upcoming appearances. We’d love to see you at any of our events! Yay! This is the post I’ve been waiting for, Laurie! I can’t help thinking about other posts from years back when you waited to publication to now see you and Cordelia with your book, and to see the book tour dates. 😀 Congratulations!